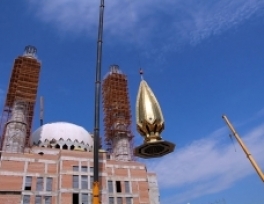 The building will include four minarets with a dome and crescent”- said the foreman of the construction Rinat Arslanov. Minarets of the Russia's largest mosque was crowned with cupolas. According to the project construction of the mosque will be completed in three years. The general sponsor of the construction is the Charity Fund "Ural". 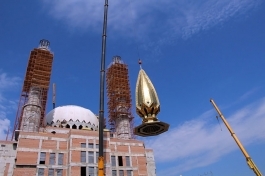 "The building will include four minarets with a dome and crescent”- said the foreman of the construction Rinat Arslanov. "It is especially pleased to work here, because you feel the participation in the historic event." Diameter of the dome is 11.6 meters, its height is 46 meters. Height of the minarets is 74 meters. For the first time the two minarets will be equipped with elevators. It is worthy to note that the mosque will be the second after Sulaymaniyah mosque in Istanbul, which main dome is 53 meters high. The mosque will accommodate more than two thousand people. It will be also built madrassas and library on the territory of the mosque.